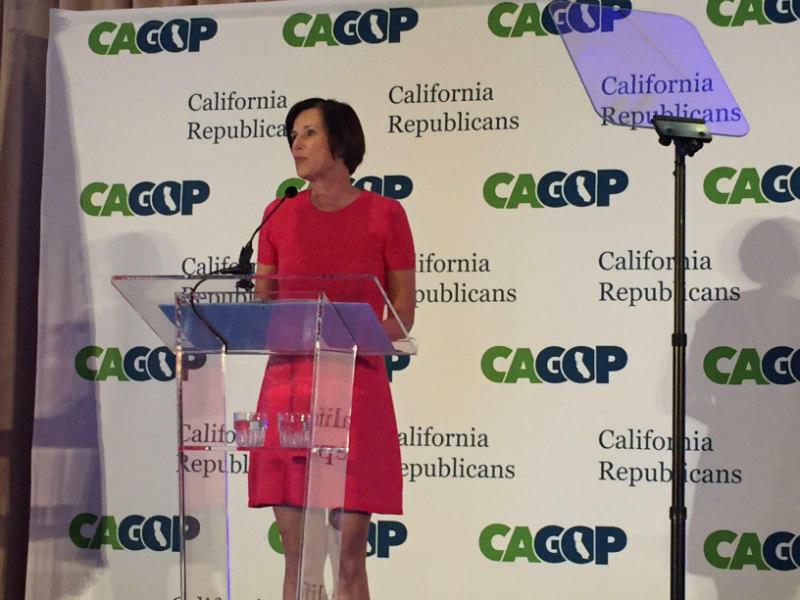 Congresswoman Mimi Walters of Irvine speaks at the 2018 California GOP convention. Congresswoman Mimi Walters of Irvine acknowledged in her opening night speech that Trump was not her first choice for the presidency in the 2016 primaries. But she also praised the president’s ability to connect with and energize rural and small town voters, some of whom had previously voted for Democrats. Speaking to reporters after her speech, Walters freely admitted she faces a difficult re-election campaign. "I've never seen the left, in Orange County specifically, be this energized," she said. "And I think it's because, you know, it's a midterm election and their party's not in power." Walters’ is one of five Republican-held districts that voted for Hillary Clinton in 2016. But the congresswoman left no doubt: She is on Trump's side, and would be glad to let him campaign in her district. "If the president wants to come out, I welcome him," she said. "None of those decisions have been made yet, of course. It's very early, so we'll see what happens." Retiring Congressman Darrell Issa, whose 49th District covers San Diego and Orange counties, said Republicans running for Congress should focus on the strong economy, the GOP tax bill passed last year and Trump's efforts to denuclearize North Korea. "If it's about Trump and his tweets, we have one set of discussions," Issa said. "But if it's about Trump and his policies and accomplishments, I think the voters are going to be favorably inclined to say you know what, this administration has done some things that previous administrations for decades didn't." Eight Republicans are on the ballot in the 49th District, including Assemblyman Rocky Chavez, Board of Equalization member Diane Harkey and San Diego County Supervisor Kristin Gaspar. A recent poll suggested Chavez has the support of 16 percent of likely voters in the district — more than any of the other 15 candidates. Democrat Doug Applegate, a lawyer who came surprisingly close to beating Issa in 2016, came in second in the poll with 12 percent. Harkey, who won the endorsement of Issa and the San Diego County Republican Party, came in fourth with 8 percent. Much of the talk at the convention centered not on federal, but state issues — including an initiative to repeal last year's 12-cent increase to the state gas tax. The GOP is hoping that will turn out more conservative voters in November and help shield Congressional Republicans from an energized Democratic base. San Fernando Valley resident and convention attendee Kira Innis sported a red "Make America Great Again" hat throughout the weekend. She said she wants to see all Republican candidates embrace Trump regardless of any threats they may face from Democratic challengers. "I think that everyone in California, all branches of office and government, need to put their support behind our president," Innis said. "Because when he wins, we win. If he's unsuccessful, we're unsuccessful. We are tied together, and we're in the same boat." The GOP District 4 candidates lay out positions. For four straight elections, Oregon U.S. Representative Peter DeFazio (D-Springfield) has faced Republican Art Robinson in the general election for the 4th Congressional District. That could change this November, because Robinson faces several opponents in the primary election next week (May 15th; ballots went out in late April). Curry County Commissioner Court Boice also is making a bid for a move to Washington, along with Jo Rae Perkins of Albany, Michael Polen of Grants Pass, and Stefan Strek of Pleasant Hill. 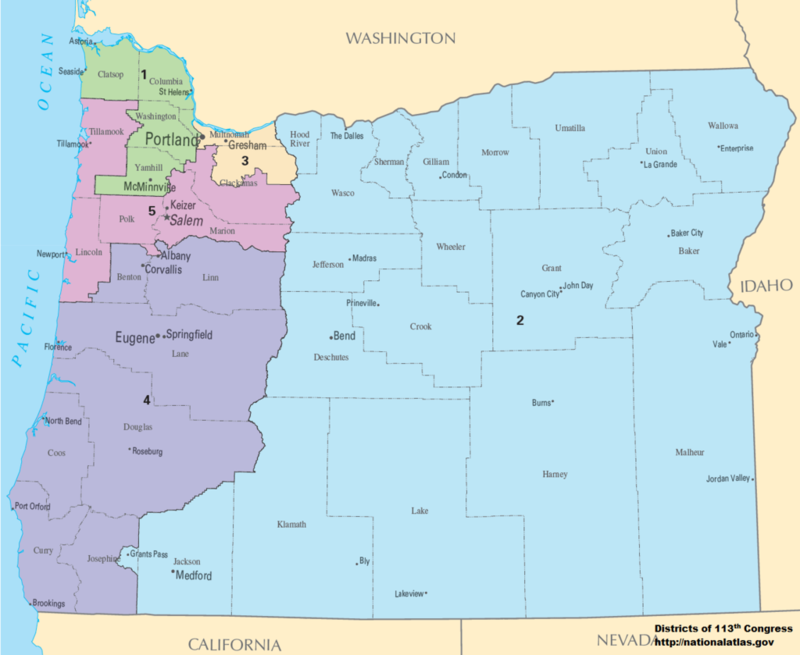 The fourth district is big, running from the California state line up to the Mid-Willamette Valley, and including the whole South Coast.